In her 2016 article, “Scientific Explanation of Unique Cat Behaviors”, Dr. Hazel Carney writes, “The queen uses it to tell her kittens "I'm here." Kittens 2 days old or older use it to say "hi" to mom and after 3 weeks of age they also signal to each other "It's dinner time." When they reach 12 weeks old, they use it to indicate hunger or loneliness. After 20 weeks kitten purrs become adult purrs in meaning. For adult cats, purrs indicate a cat's emotional state. They may purr when content, either alone or with someone. This purr is melodious and the cat usually shows other signs of happiness such as kneading or bunting if with a favorite associate. If instead the cat is anxious or trying to appease a dominant cat, it may purr at a higher pitch in a tight body posture. This purr serves the same purpose as nail-biting, whistling, or a tight smile for people. The purr may also be a form of self-medicating”. The actual mechanism by which cats purr is still up for debate, but scientists have shown that purring is produced from intermittent signaling of the muscles in the larynx and diaphragm during both inhalation and exhalation. Interestingly, cats purr with a consistent pattern and frequency between 25 and 150 vibrations per second. Various investigators have shown that sound frequencies in this range can improve bone density and promote healing. Research also suggests that purring lowers cats’ levels of bone and heart disease and stimulates the growth of bone and muscles. 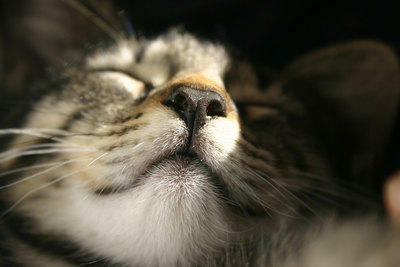 A cat’s purring can work as a low and gentle workout to stay healthy and slim! (https://www.scientificamerican.com/article/why-do-cats-purr/). Finally, we are lucky that there is the added benefit to humans. Cats have often been shown to have a therapeutic benefit on humans and even lower blood pressure in some people. Dr. Brooke Kugler certainly sees the calming presence her cats have on her kids every night as she tucks them into bed and watches them pet a purring cat as they fall asleep.